Discussion in 'Antique and Vintage Jewelry' started by FlashyFlamingo, Apr 14, 2019. One of my favorite eBay vendors has these little turquoise earrings and I’m tempted to bid. 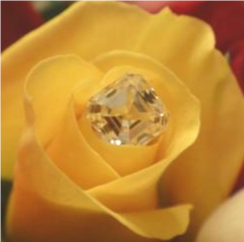 I’m no rose cut diamond expert, I have one small solitaire ring that is a pain to keep clean, so I rarely wear it. I know from experience with purchasing from this vendor that they do not clean their items before photographing and selling. So I’ll ask the experts here, any way that these are just very dirty rose cuts or are they just grey, blah little diamonds? They look very included and I am not sure a cleaning will make them pretty. Can you ask the seller to clean them and take new photos? That’s kind of what I thought. From certain angles they looked like years of grime and from others they just looked ugly. I’ll see if the seller can try to clean them up a bit. I wouldn't ask them to clean them up. They are a business. If they wanted to put that much labor into them in the first place - they would have. I see it as an excuse for them to raise their price - or refuse to negotiate down any. I don't know the asking price of these to comment on that. I'm thinking good costume jewelry price range? If they don't need rehabbing. But if you like them, and still would like them knowing they are super wonky and included 50 shades of grey - negotiate the price to be appropriate. The one in the left looks like caked sand all up in there!?!? If you clean them up and see damage to the settings that would require a rehab and it's not with it or they just won't clean at all- then you return them for full refund assuming their policy is so. What?!?! ?How would that happen? I don't understand? FlashyFlamingo, stracci2000 and JPie like this. Both included and need cleaning. Bit surprised at how good the turquoise cabs look, would expect discoloration given the condition of the rest of the earrings. Might be replacements or something other than turquoise? Probably thought the diamonds were too pale and needed some color... or dirty hands or a makeup sponge. I dont like where this is taking my brain. I feel sick. BTW - good costume jewelry to me means like $100. The diamonds look dirty and included. One is a poorly matched replacement. If you do get these, be sure to get the the turquoise tested to confirm that they’re not glass or another dyed gem. I don’t think those are rose cuts so much as “uncuts” or rough-cut crystals. And they do look very included. They’re interesting and quirky, but I don’t think they’ll ever be real sparklers. "If money can fix it, it's not a problem." ~ Tom Magliozzi of "Car Talk"
junebug17 and FlashyFlamingo like this. I have to agree I don't think this is a worthwhile piece to pursue but if you were curious you could ask them to clean it up and send you more photos. But IMO those are fugly diamonds if you enjoy sparkly diamonds. Thankfully someone outbid me. The more I looked at them, the uglier they got! anangel, Pimberly, kgizo and 1 other person like this. Sometimes, getting outbid is a blessing in disguise!